In Music We Trust - Major Healy: Nonstop! 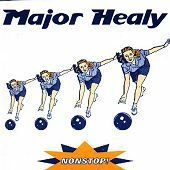 Buffalo, New York's Major Healy blend ska, pop-punk, and some rock 'n' roll (not to mention some humor) into a tight, hook-filled, danceable combination that will have you jumping up and down, moving around, and smiling note after note, line after line. On their debut EP, NONSTOP!, they demonstrate a lot of promise as well as a good time. "Now's the Time," "Sitting in a Bar with Jack," "Change It," "Boot in the Face," and, well, "Twisted Wonderland (basically all five tracks on this disc) all mix a high-octane, sugar upbeat with bright horns, smooth vocals, and a dancing rhythm section to create their bouncy sound. If ska-pop is dead, Major Healy don't know it, because the music is filled with humor and soul, the things that seem to make the band tick. To be honest, a lot of the ska-pop stuff I've heard lately, and some of the old stuff I really used to enjoy, just doesn't do it for me anymore. It seems to be slapstick music geared at giving you a quick sugar rush and then dying off. And, even though Major Healy gives you a quick sugar rush, their humor and danceable mayhem just doesn't seem to want to wear off for the time being. I'll give this a C+.